Last week my article Using Protobuf instead of JSON to communicate with a frontend ended up being number one on Hacker News and we saw a crazy amount of traffic coming on this blog. I thought that it would be interesting to analyze some of that data so here it is. It is coming from Google Analytics and while I could just paste screenshots, that wouldn't be any fun so I exported some of it as CSVs and used them in the notebook you can see below. The data is over the past month to have more insights on various social "strategies" (or rather, lack of) as you will see in a bit. We always tweet when we post an article but only post to HN/Reddit the ones we feel are interesting enough. Article 1 has not been posted anywhere, number 2 has been posted on r/python and number 3 and 4 were both on the front page of HackerNews, with number 4 being at the top for some time. From that graph and my experience with my previous blog, HN brings way more readers than reddit or twitter. Let's have a look to see if I'm right.  We can see most of our sessions are coming from Social, which includes HN/Reddit/Twitter mainly: 16,946 to be exact. 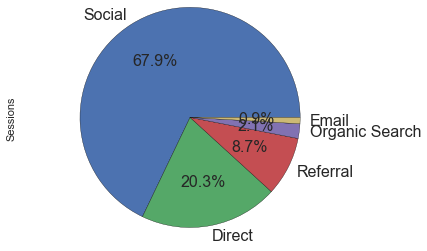 We also have a significant portion of users coming from referrals which are mainly Python newsletters, feedly.com, lobste.rs, hckrnews.com and flipboard.com. I was a bit surprised by the Twitter amount so I went and found that there is a HN bot with lots of followers that tweets the articles. I guess most of them come from that tweet since we are not really active on Twitter ourselves. This is cool but I am more interested on what location/devices the people are using so let's have a look.  As expected, most of the users are from English speaking countries, the articles being written in English after all. We could translate them into French/German if we wanted but that wouldn't be worth the effort of maintaining multiple versions of each article. In terms of cities, the top 3 are San Francisco, New York and London. Again nothing surprising. The first non english-speaking city is Berlin at the 8th position but Paris is only 4 sessions away from overtaking Los Angeles and taking the 10th position. To me, having people in thousands of cities in over 100 countries reading what we write is pretty mind-blowing and is by far the best part. 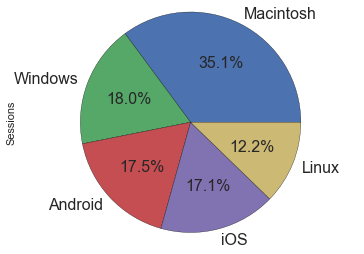 I couldn't finish that notebook without satisfying some of my curiosity: what devices/OS/browsers are used? First, what devices are readers mostly using? Nothing surprising here either, most people browse websites from a computer. In the mobile/tablet category, iPhone and iPad are the big winners in terms of number of users but Android still wins due to the sheer number of devices as we will see below. If anyone is working on a B2B app, would you be able to share those numbers? It seems to me that you could forego responsiveness for quite a lot of B2B products, or only have a basic one. Interestingly enough, Android and iOS are almost identical. I have to say I'm a bit surprised by the predominance of Macs, I was expecting it to be at around 25% and have more Linux users than that. For Windows and Mac, it seems the readers are using majoritarily the last 2 versions of each OS, with 7 being the most used version for Window and 10.10 for Mac. A special hello for the person that came from Windows Server 2003 and the few still on Vista. Let's see what browsers everyone is using now. This is a pretty damn big win for Chrome here and almost all of those are on Chrome 42 or 43. 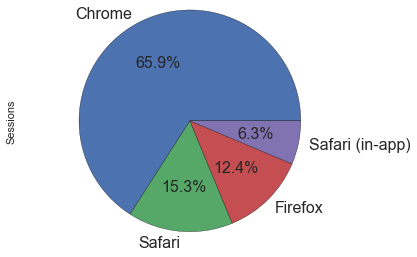 Most Safari and Firefox users are also on the latest version of their respective browsers. About 200 sessions came from IE and they were mostly using IE10 or IE11 so if you are a frontend person and you are targeting the HN crowd, you don't have to worry about old browsers really (but I think you already knew that). Looking at the list below those major players is interesting though, you find out about things like Amazon Silk or YaBrowser. Just a quick word to praise static sites: we ran 15 QPS excluding static assets (50 QPS including those) on a micro instance at 0.0 load with 500 concurrent users. We use Pelican but any of the dozens of other similar tools is fine and you can handle ridiculous amount of traffic without any worries. You can also host the blog on S3 or a CDN if you don't want to have a server at all. Using a static site generator also makes it easy to review and improve articles, like you would do for code reviews. The only pain point is commenting on notebooks, as it is not possible to do so on the rendered version on Github and a raw notebook looks like that. You can check our blog repo and look at the issues if you are curious about that process.